home-garden-rewardpath.com has a scam going where they offer a "free" logsplitter which is actually a premium for signing up for several expensive services and products. 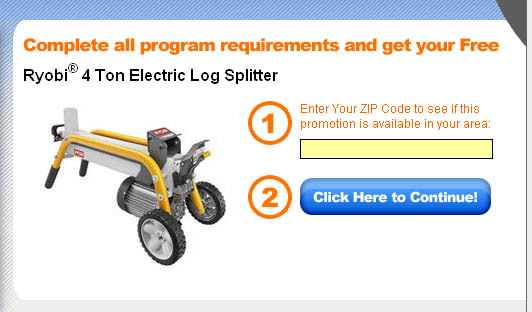 Read the many pages of fine print to see how much you have to buy to earn your "free" logsplitter. I have recently received some emails that confirmed my earlier post about this company. One of the real giveaways of a scammer is that they generate anonymous emails telling us that the company is really wonderful to deal with, there is no catch and we are maligning a wonderful company, etc., etc. Hello there. Im not sure why you think this site is a scam. First they send you a check in the amount of the log splitter, you do not need to sign up for a ridiculous number of offers, and lastly I have completed this site and MANY others to recieve a good deal of money. Tell me more about your experiences with this company. I got an immediate response that the email address was false. This is the second of these faux recommendations I have received, so until I hear otherwise I am recommending that you avoid this offer as though it was a letter from those friendly Nigerians who want to put money in your bank account. This entry was posted in Online Scam and tagged bait and switch, Free Logsplitter scam, home-garden-rewardpath.com, ripoff, scam. Bookmark the permalink. There are more new scams every day. I get some really absurd ones. I had one today from a woman who was supposedly sick with cancer and chose me — ME! — to give her money. I was so appreciative of her attention, but decided against making the donation. Ha.